Later merchants settled down in the area of the Eiermarkt. Written references explaining the town`s early beginnings started with sources of the 11th. century. 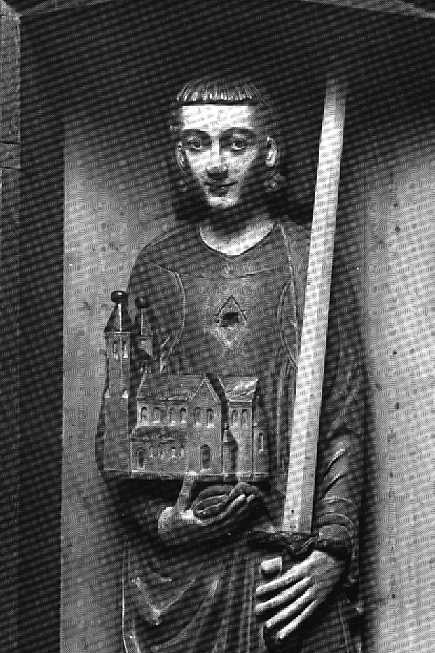 About 1030 the Brunonian countess Gertrud founded St. Blasius`Cathredral, which was consecrated by Bishop Godehard of Hildesheim, on an peninsula in the Oker River, and in the Altewiek Bishop Branthag of Halberstadt consecrated St. Magnus`Church. The document of this consecration in 1031 still exists and here we find the name of Brunswick mentioned for the first time, then called „Brunesguik". An important development of the town started during the regency of Lothar of Süpplingenburg,(Lothar) who had been Duke of Saxony since 1106, and under the name Lothar III., ruled from 1125 to 1137 as emperor. He wanted the town to be extended and so the municipal area of the Altstadt with the centre Altstadtmarkt was built. 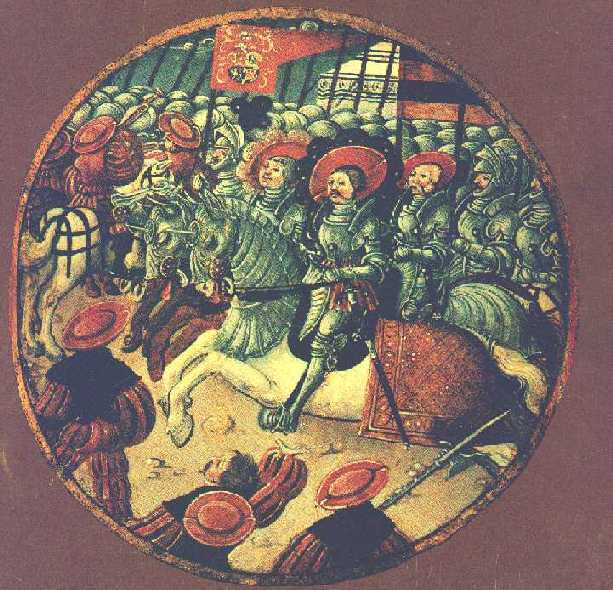 Supposingly the Altstadt received the town charter by Lothar III. after 1117. 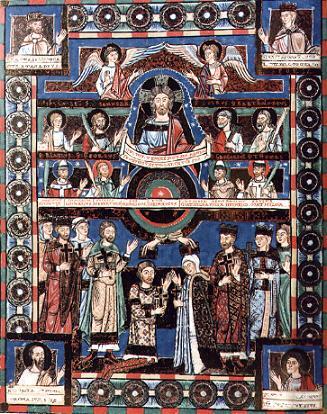 A much more decisive epoch for the town became that of his grandson, Henry the Lion (about 1130 -1195). 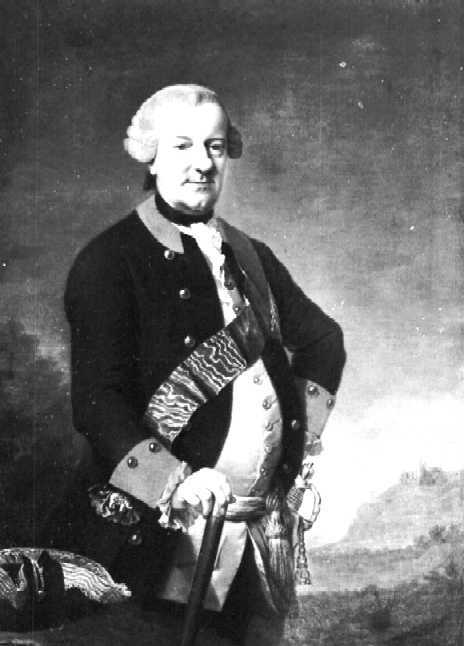 Brunswick extended during his government, because he put up his permanent residence here. Together with the courts of England and France, Brunswick belonged to the most powerful capitals in Europe. 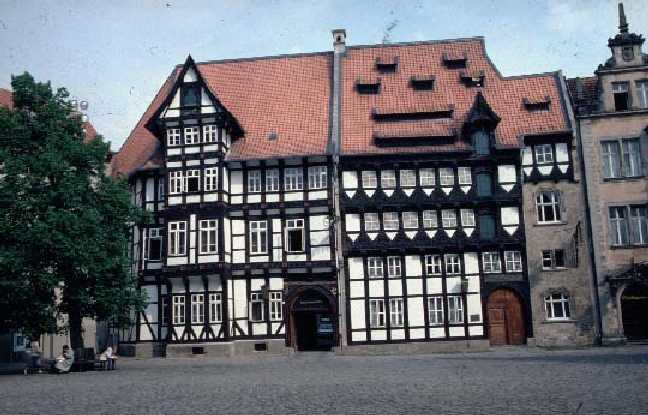 It was also the political and cultural centre of Saxony. Henry the Lion founded the new municipal area of the Hagen and started planning the Neustadt. The outstanding buildings erected during his government are the then newly constructed Dankwarderode Castle and the imposant new St. Blasius Cathredral. Henry the Lion started to build this Cathedral after his pilgrimage to the Holy Land 1172/1173. This church was provided with rich art treasures. 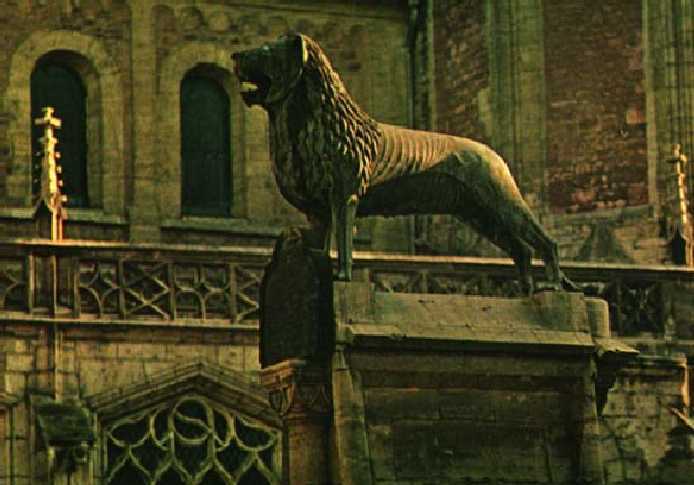 In 1168 the lion-monument was the erected. It was the first large bronze sculpture created in Nothern Europe, that was standing solitary; a speciality of medieval art. The bulk of these lands came subsequently to Henry's grandson, Otto,(Duke Otto) and in 1235 the emperor Frederick II., anxious to be reconciled with the Welfs, recognized Otto's title and created him duke of Brunswick and Luneburg. The Capital was Brunswick. Otto added several counties and the town of Hanover to his possessions, and when he died in 1252 was succeeded by his sons Albert and - John. 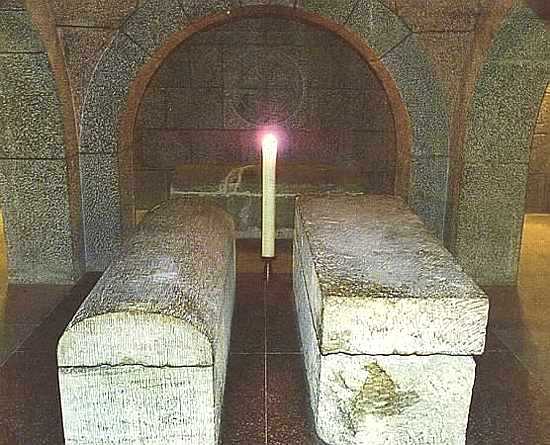 In 1267 these princes divided the duchy, Albert becoming duke of Brunswick, and John duke of Luneburg. The dukes of Luneburg increased the area of their duchy, and when the family died out in 1369 a stubborn contest took place for its possession. 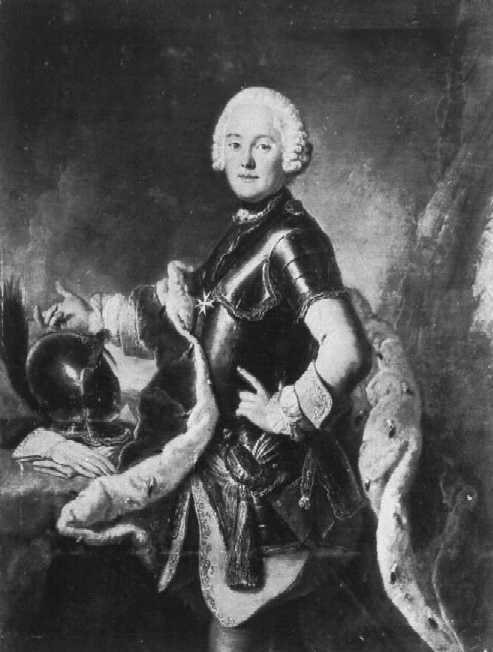 Claimed by Magnus II., duke of Brunswick- Wolfenbuttel, this prince was forced by the emperor Charles IV. to abandon his pretensions, but in 1388 his sons succeeded in incorporating Luneburg with Brunswick-Wolfenbuttel. In 1285 the duchy of Brunswick had been divided between Duke Albert's three sons, whose relations with each other were far from harmonious, and the lines of Wolfenbuttel, Gottingen and Grubenhagen had been established. The Wolfenbuttel branch died out in 1292, but was refounded in 1345 by Magnus I., a younger member of the Gottingen family; the elder Gottingen branch died out in 1463, and the Grubenhagen branch in 1396. 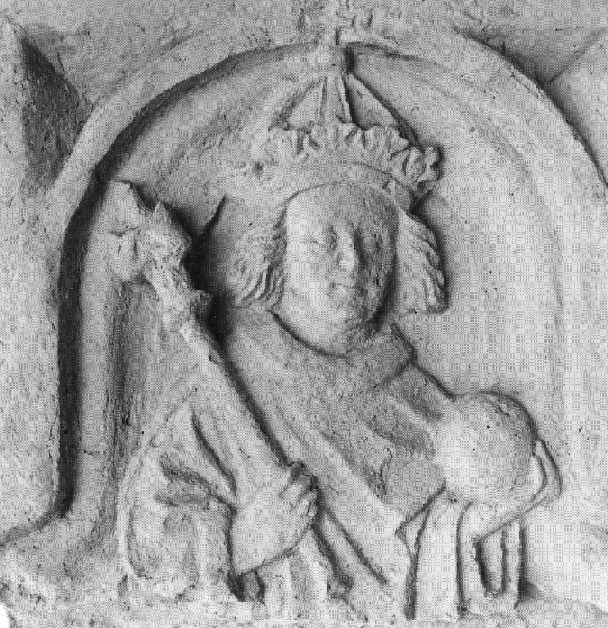 Magnus I., duke of Brunswick-Wolfenbuttel from 1345 to 1369, was the ancestor of the later dukes of Brunswick. 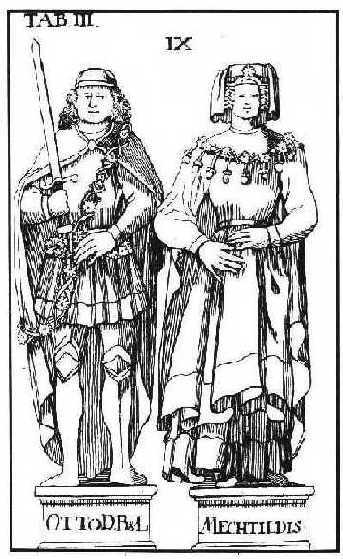 His grandsons, Frederick, the only survivor of the three, was forced to make a division of the duchy, by which he received Luneburg, while his nephews, William and Henry, obtained Brunswick, which in 1432 they divided into Calenberg and Wolfenbuttel. In 1473, however, William, who had added Gottingen to his possessions in 1463, united these lands; but they were again divided from 1495 to 1584. 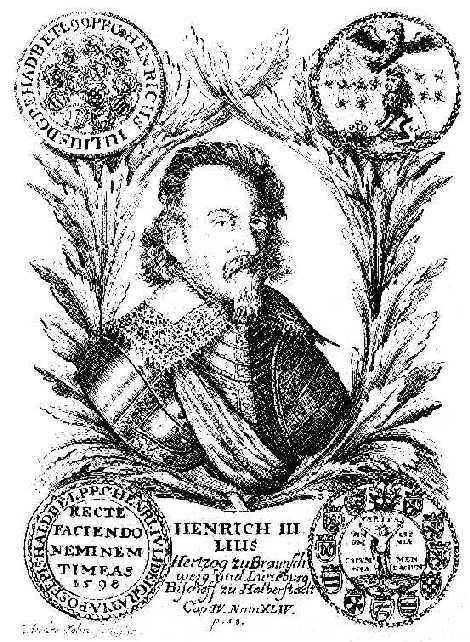 (Duke Heinrich) In 1584 Brunswick was united by Duke Julius, and in 1596 Grubenhagen was added to it. 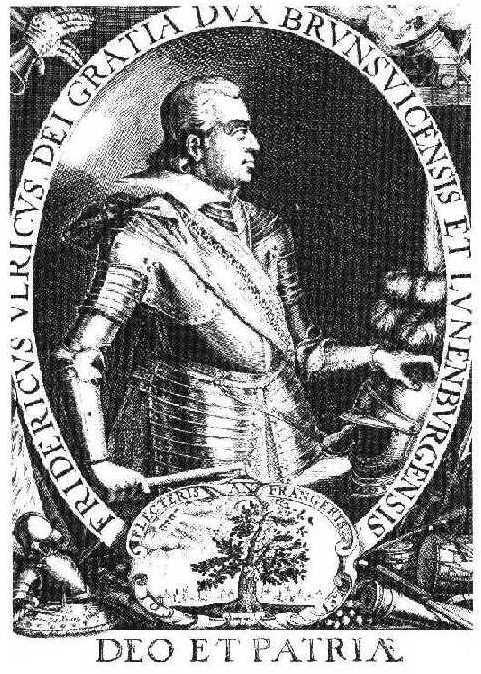 Duke Frederick Ulrich, however, was obliged to cede this territory to Luneburg in 1617, and when he died in 1634 his family became . extinct, and. 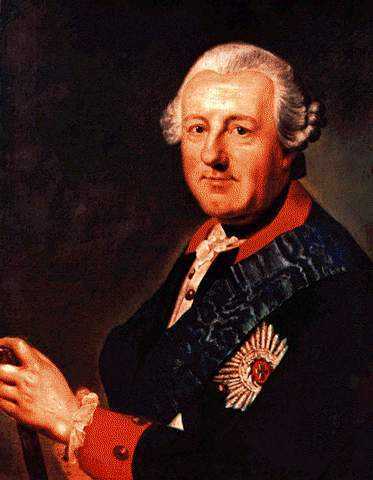 Brunswick was divided between the two branches of the Luneburg family. The duchy of Luneburg, founded by Bernard in 1428, remained undivided until 1520, when Duke Henry abdicated and his three sons divided the duchy. The outstanding historical event during the era of absolutism was conquest of Brunswick by Duke Rudolf August in 1671, that had only been possible because of the town`s fading political and economical power. At first this conquest seemed to be the lowest point in the town`s history, but then the duke`s policy turned out to be quite positve for commerce. In 1681 two trade fairs were installed and promoted trade, especially because Brunswick trade fairs soon became the third-largest in the German Empire after the fairs at Leipzig and Frankfurt. Guests and(Palace) visitors revived city life and cultural needs had to be met. 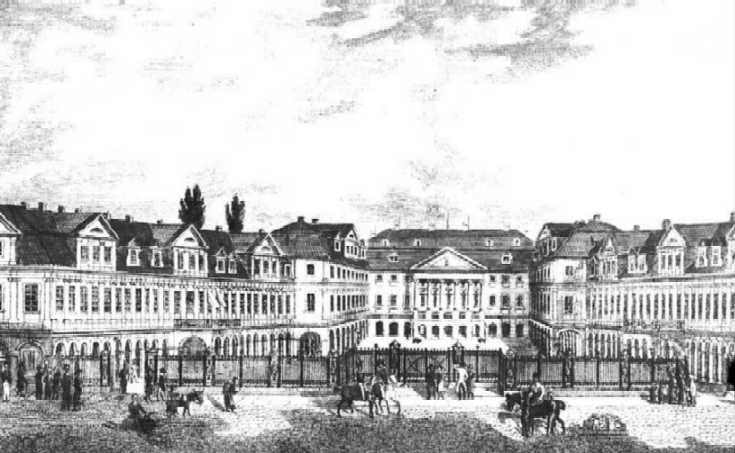 In 1690 the Ducal Theatre at the Hagenmarkt was opened. The first performances of Lessing`s „Emilia Galotti" in 1772 and Goethe`s Faust in 1829 were given there. In political and economical view, the small and torn dukedom was only of regional importance. The princesses became the most valuable treasure of the dukedom, because they were married in a way that fitted best into their family`s policy all through the centuries. 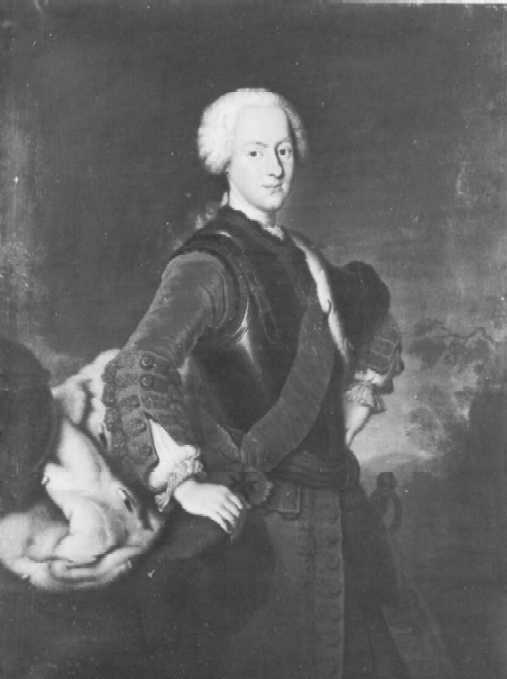 Duke Anton Ulrich, who was a famous baroque writer and art-collector also, recommended his granddaughter Elisabeth Christine as wife for King Charles III. of Spain. Of course, she had to converse to Roman-Catholic faith, but that was no problem: The professors of Helmstedt University declared the Lutherian catechism to be a shorter form of the Roman-Catholic bible. When Charles became Emporer Charles VI. in Vienna , his wife was said to be the most beautiful empress ever reigned in the Hofburg [famous before »Sissi«!]. 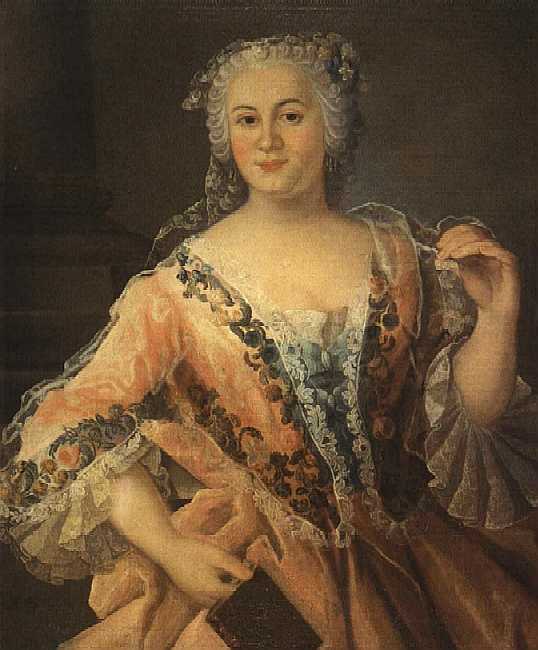 Elisabeth Christine was described as having white skin, being rather corpulent and leading a cultivated life. Beside this, she was the mother of empress Maria Theresia. It was then followed by the family of Brunswick-Bevern,(Karl I.) which had split off from the parent line in 1666 and ruled until 1884. Brunswick has not played a very important part in German politics. Many counties were added to its area, but it was weakened by constant divisions of territory, and during the period of the Reformation some of the princes took one side and some the other. The treaty of Westphalia in 1648 made little difference to its prestige, but its subsequent position was greatly affected by the growth of Prussia. ruling since 1735, promoted culture and economy (Carl I.) in his residential city. His most important achievement was the(Carl) foundation of the „Collegium Carolinum",(Carl) a precursor of nowadays Technical University, the oldest Technical University in Germany? 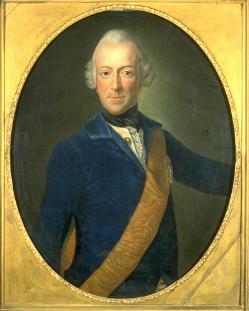 (Carl I.) 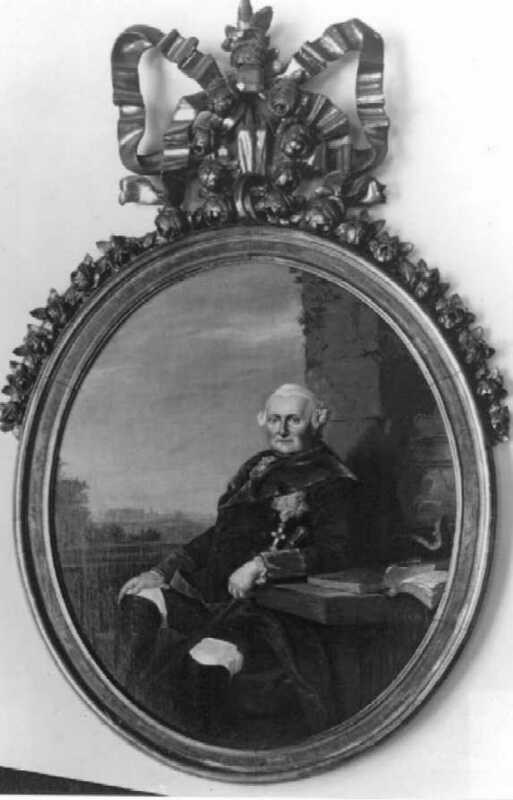 His son Carl Wilhelm Ferdinand also supported the town. (1),(2) He was married to (3),(4),(5),the english princess Augusta, sister of King George III. For that reason You can visit our Richmond Castle in Brunswick. As being very interested in the ideas of the Enlightment, he strengthened mercantilism by supporting factories as e.g. Stobwasser.(Stobw.) 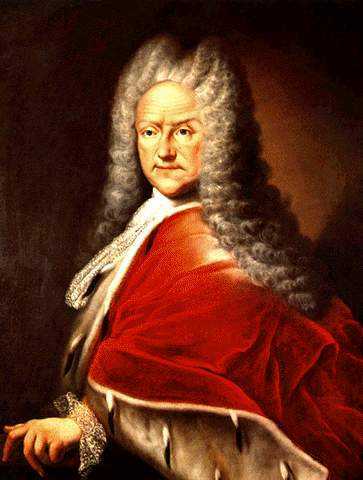 He also supported Carl Friedrich Gauß, promoted Louis Spohr and hired Gotthold Ephraim Lessing as a librarian at the ducal library in Wolfenbüttel and also persuated Johann Heinrich Campe and Friedrich Vieweg to work in Brunswick. The regency of Carl Wilhelm Ferdinand was certainly one of the most significant epochs in Brunswick`s history since the Middle Ages. (duke), Until today the changes in the townscape can still be seen. During the Seven. 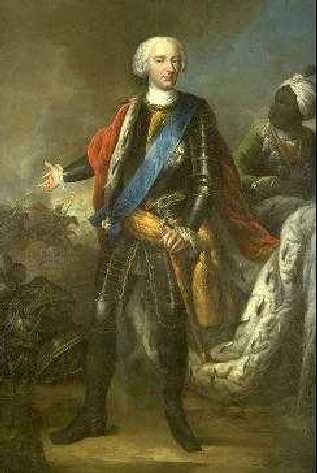 Years' War Brunswick supported Frederick the Great, and in return was severely ravaged by the French. 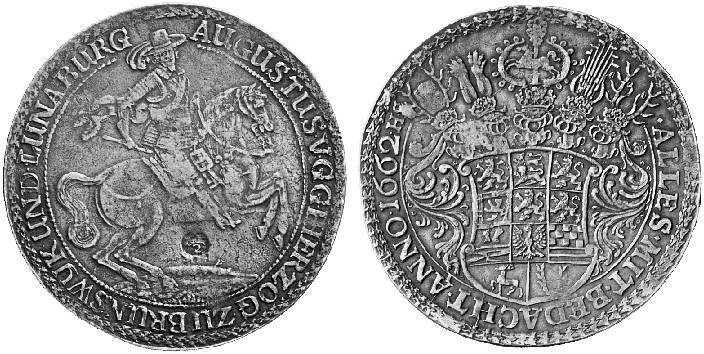 Duke Charles I., who accumulated a large amount of debt, sought to discharge his liabilities by sending his soldiers to assist England during the American War of Independence. 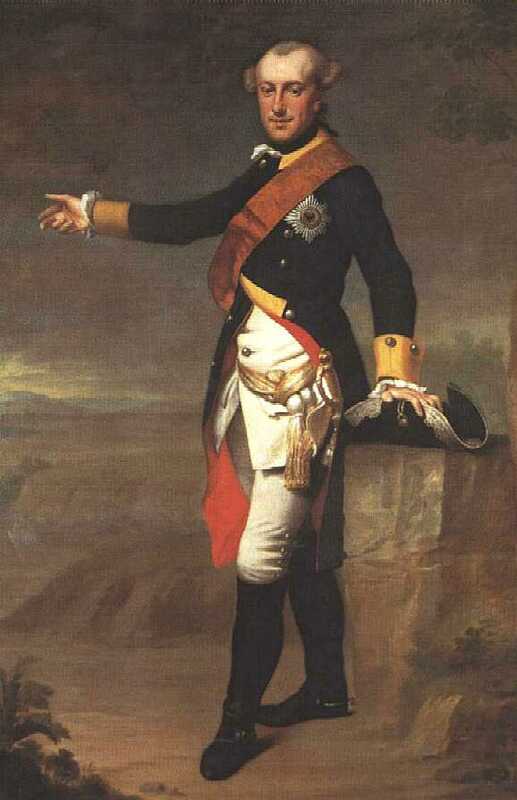 The succeeding duke, Charles William Ferdinand, brought order into the finances, led the Prussian troops against Napoleon, and died in 1806 from wounds received at the battle of Auerstadt. Napoleon then declared the ducal family deposed and included Brunswick in the kingdom of Westphalia. In 1813 it was restored to Duke Frederick William, who was killed in 1815 at the battle of Quatre Bras. His son, Charles II., while a minor, was under the regency of George, afterwards the English king George IV., who ruled the duchy through Ernest, Count Munster-Ledenburg (1766-1839), assisted by Justus von Schmidt-Phiseldeck (1769-1851). A new constitution was granted in 1820, but after Charles came of age in 1823 a period of disorder ensued. The duke, who was very unpopular with his subjects; quarrelled with his relatives, and in 1830 a revolution drove him from the country. The government was run by his brother William, and in 1831 Charles was declared incapable of ruling, and William was appointed as his successor. The ex-duke, who had a fine collection of diamonds, died childless at Geneva in August 1873. William's long reign witnessed many excellent and necessary reforms. A new constitution was granted in 1832, and in 1844 Brunswick joined the Prussian Zollverein. Trial by jury and freedom of the press were established, many religious disabilities were removed, and measures were taken towards the freedom of trade. Brunswick took very little part in the war between Prussia and Austria in 1866, but her troops fought for Prussia during the Franco-German War of 1870-71. The duchy joined the German Confederation in 1815, the North German Confederation in 1866, and became a state of the German empire in 1871. In 1866 the question of the succession to Brunswick became acute. 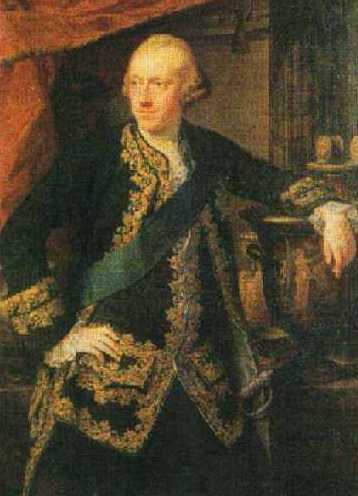 Duke William was unmarried, and according to the existing conventions it would pass to George, king of Hanover, who had just been deprived of his kingdom by the king of Prussia. In 1879, however, the duke and the estates, with the active support of Prussia, concluded an arrangement for a temporary council of regency to take over the government on William's death. Moreover, if in this event the rightful heir was unable to take possession of the duchy, the council was empowered to appoint a regent. William died on the 18th of October 1884, and George's son, Ernest, Duke of Cumberland, claimed Brunswick and promised to respect the Germanconstitution. This claim was disregarded by the council of regency, and the Bundesrat declared that the accession of the duke of Cumberland would be inimical to the peace and security of the empire on account of his attitude towards Prussia. 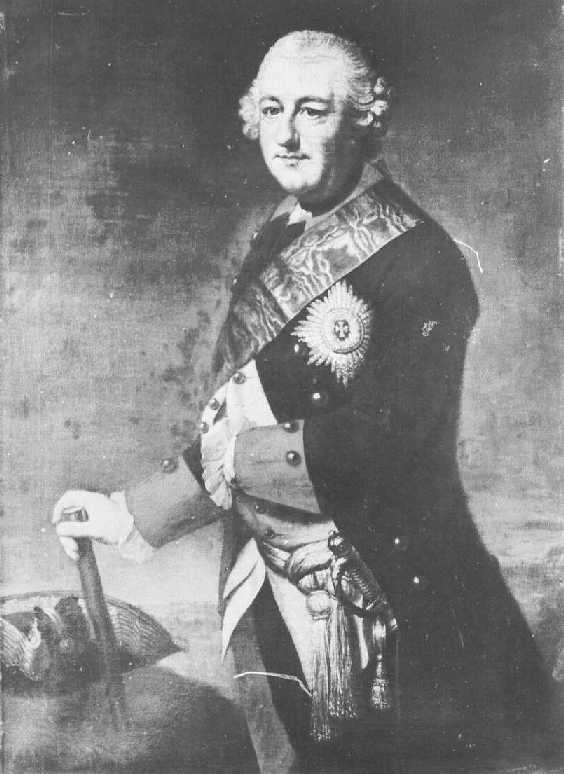 In the following year the council chose Albert, prince of Prussia, as regent, a step which brought Brunswick still more under the influence of her powerful neighbour. Albert died in September 1906, and after some futile negotiations with the duke of Cumberland, the Brunswick diet chose Duke John Albert of Mecklenburg-Schwerin as regent in May 1907. By 1831 the fortifications were demolished and the architect Peter Joseph Krahe finally turned them into promenades surrounding the whole city. At the 7th of September 1830 the castle was burned down and looted. The only revolution in Europe in 19th century which ousted an regent. 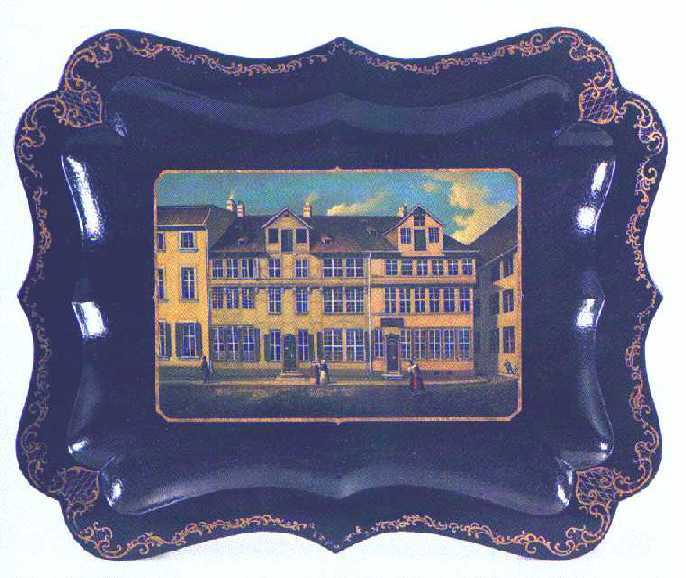 In 1831 the new residential castle in classicistic style was build. 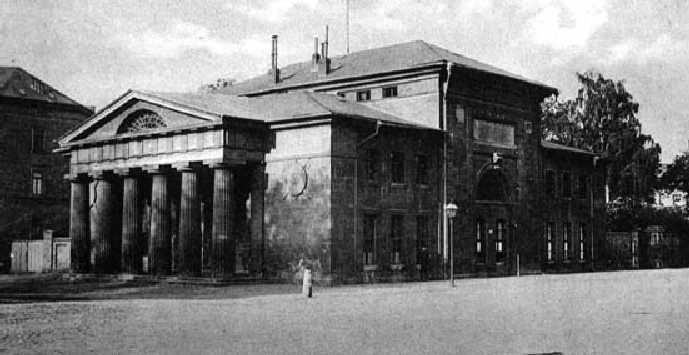 The architect of this great building was Carl Theodor Ottmer, who also made the plans for the first railway station, because since 1838 there was the first State-Railway from Brunswick to Wolfenbüttel. Brunswick received the complete self-government by the so-called „Allgemeine Städteordnung" in 1834. After the foundation of the German Reich in 1871, Brunswick developed very fast. In the period from 1850 to 1880 the number of inhabitants grew from 39.000 to 75.000. By 1890 there were more than 100.000 people living in the city of Brunswick. Industrialisation and technical progress reached their heyday .In 1892 the first calculating machines were produce by "Brunsviga", which soon were sold all over the world. 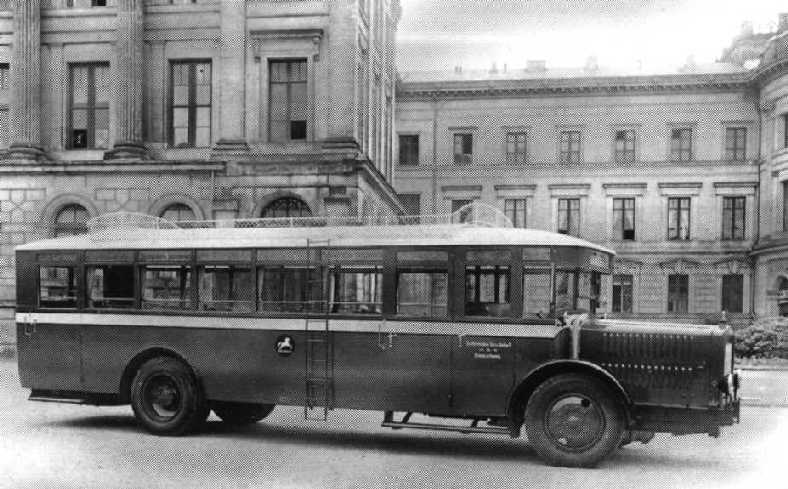 The industrialist Heinrich Büssing,(Bus) who started his career by building bicycles, established his factory for motorvans and motorbuses (which is now MAN) in 1904 and only one year later a regular busline between Braunschweig and the village of Wendeburg started. When the only daughter of Emperor Wilhelm II., Victoria Louise, married Duke Ernst August, the Welfs reigned in Brunswick again, but only for a short while. The beginning of Word War I. abruptly stopped Brunswick`s further development. When in November 1918 the revolution started, Duke Ernst August abdicated. The Dukedom of Brunswick ceased to exist. In the 1920s, though there were political problems and the great inflation, economy began to recover. In 1920 the Rollei factory was founded by Franke and Heidecke. In the Weimar Republic a rich cultural life flourished. People were happy that the had overcome the terrible war - and could hardly imagine that it would get even worse in near future. On January 30, 1933 the National Socialists had come to power. Important institutions of national socialist power structure became established in Brunswick. The castle was turned into a SS-Junkerschule. 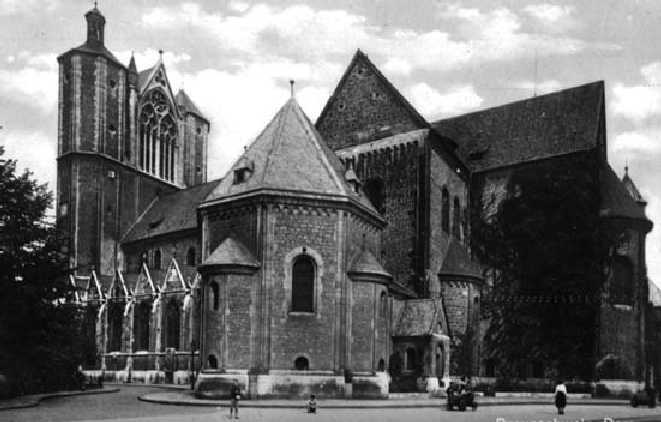 Brunswick Cathredral was declared "Staatsdom" and was changed into some kind of national socalistic place of pilgrimage. During heavy air-raids, especially in the bombing raid of 14./15th of October 1944, 90% of Brunswick city was destroyed; nearly 3000 people died. Historical Brunswick was lost. Since the end of World War II. the townscape had changed. The town`s reconstruction was difficult, there were not enough flats or houses and 50% of all the factories were destroyed. Nearly 80.000 refugees and expellees came to Brunswick. Commerce and industry of the town suffered from the nearby East German border, which made trade with the former eastern surroundings impossible. Brunswick became "City of research", when scientific institutes as for example the DLR were established here. In the 50s the townscaped was changed into a modern city fit for traffic; the streets were broadened and parts of the famous old town quarters completely disappeared. 0n 1st of October 1960 the new railway station opened and in the same year the ruin of the castle was torn down. Of course, there had been lots of other events in Brunswick history on way from a medieval to a modern town. Nowadays science and culture, research and trade are equal partners in our city. After the fall of the East German border in autunm 1989 Brunswick now is again located in the middle of Germany. It really is a town worth visiting as well as living in it. 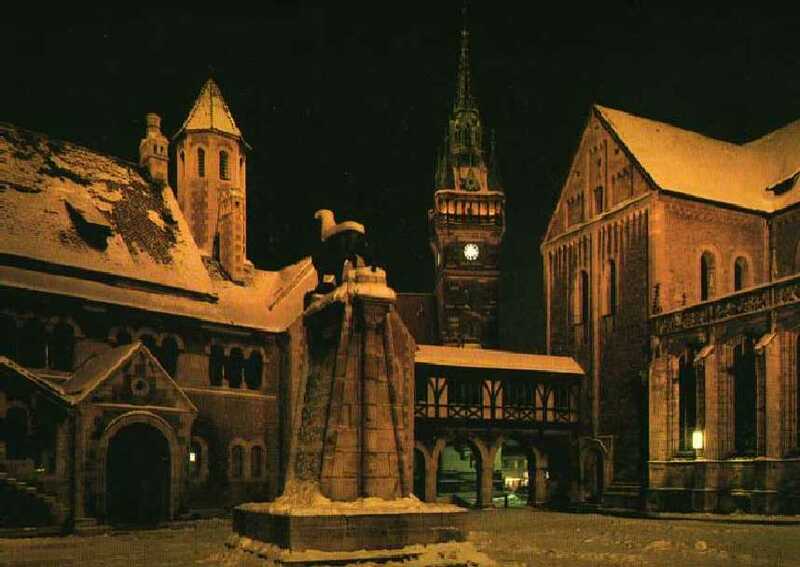 Braunschweig (known in English-speaking countries as Brunswick) was probably founded (Burgplatz) by traveling tradesmen as a store and resting-place near the castle Dankwarderode(Burgplatz) more than a 1000 years ago. 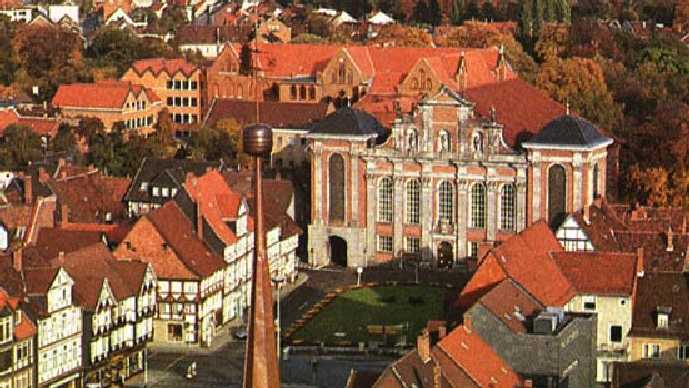 The favorable location of the market settlement was no doubt the reason for Henry the Lion's(Lion) choice in selecting Braunschweig as his residence in the twelfth century. 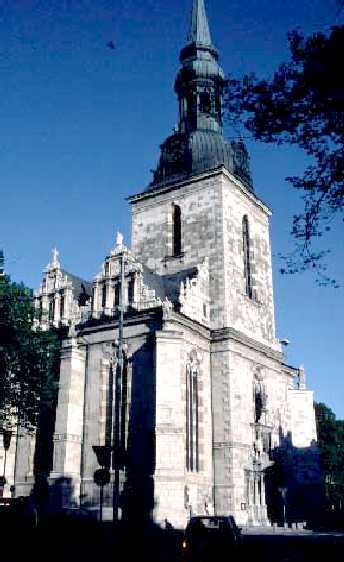 The cathedral(Cath.) and the lion still indicate the cultural importance of the ducal residence and are the city's(Old Artillery Barracks) landmarks. The extensive, attractive pedestrian precincts offering large department stores and many specialist shops are - like the charming passages - an open invitation to buy, window shop, or maybe just relax. 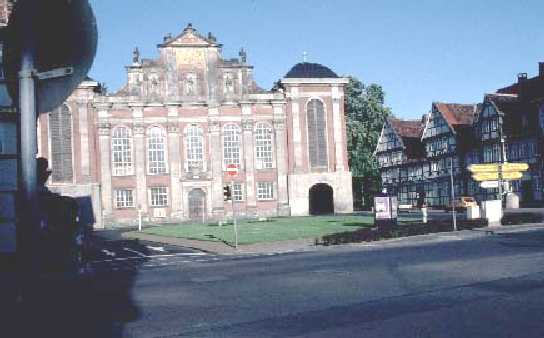 For more than three centuries, from 1432 to 1754, Wolfenbuettel was the capital of the Dukes of Brunswick and Lueneburg. 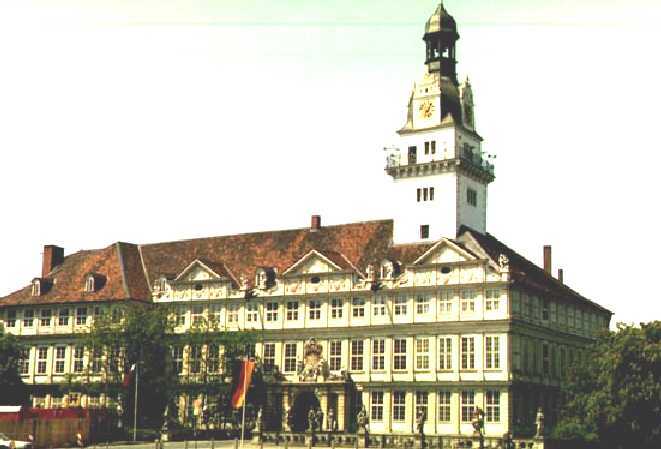 The Guelph Duke's palace,(Palace) the largest surviving palace in Lower Saxony, reflects the splendor and importance of the town during those years. Duke Julius turned the old fortress town into the first example in Germany of a Renaissance city, planned on a grand scale. Many magnificent historical buildings and remarkable churches(Church of St.Mary's)(Garrison Church) have been preserved, as have the old Town Market and over 500 picturesque half-timbered houses,(City Center) standing together in a compact area into which later styles have hardly intruded. The collections of the world-famous Duke August Library together with the Arsenal, Lessing House, the palace and the former ducal chancellery are treasure-houses of Europe's cultural heritage.